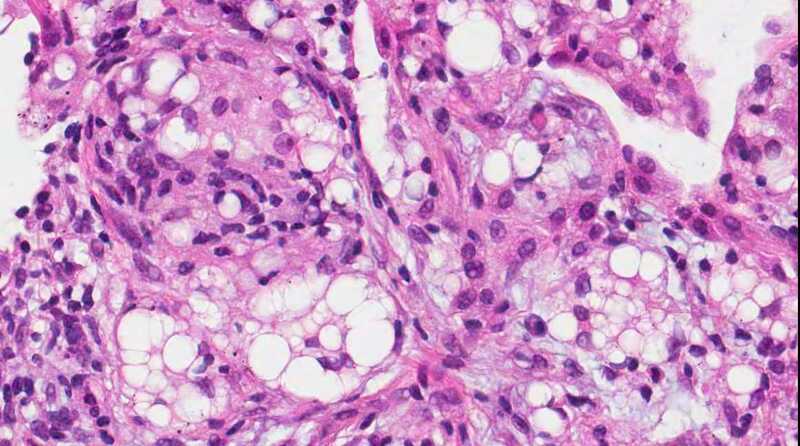 Thanks to Dr. Mattia Barbareschi, MD, Trentino Biobank (Italy), for contributing this case. To contribute a Case of the Week, follow the guidelines on our Case of the Week page. (1) Do you want to look up an old Job, Conference or Fellowship ad? We post the existing version of each of these files as of the first of the month in this format: jobsYYYYMM.html, jobsrelatedYYYYMM.html, fellowshipsYYYYMM.html and conferencesYYYYMM.html, where YYYY is the year (i.e. 2013) and MM is the month with two digits (i.e. 09). These files started in 201108 (August 2011). So, to look up jobs posted on February 1, 2013, visit www.pathologyoutlines.com/jobs201302.html. (2) In September 2013, we again had record traffic of 446,886 visits (over 10 million "hits"), averaging 14,896 visits per day, a 45% increase from September 2012. On October 1, 2013, we had a new single day record of 19,165 visits. We continue to convert all topics to our new format, to add more images, to add new Stains and CD Markers, and to update stains, CD markers and the 20 "oldest" chapters. 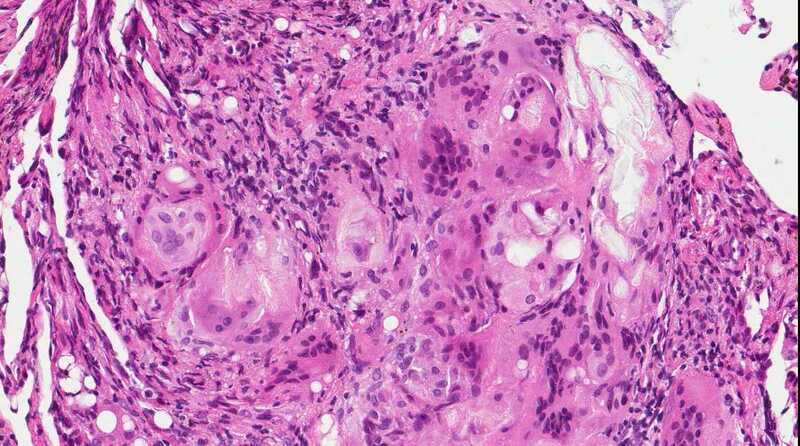 (3) At ASCP, one suggestion was a "Journal Watch", a monthly review of 3-5 important articles for pathologists. We would format it with links to the PubMed abstracts. If you may be interested in being the Journal Watch editor, please contact Dr. Pernick at NatPernick@hotmail.com. (4) Don't forget about the Google search bar located at the top of our Home page, which can be used to search our entire site . We are planning a new version of our website with better formatting for SmartPhones, and a "topic" search bar - more to follow. 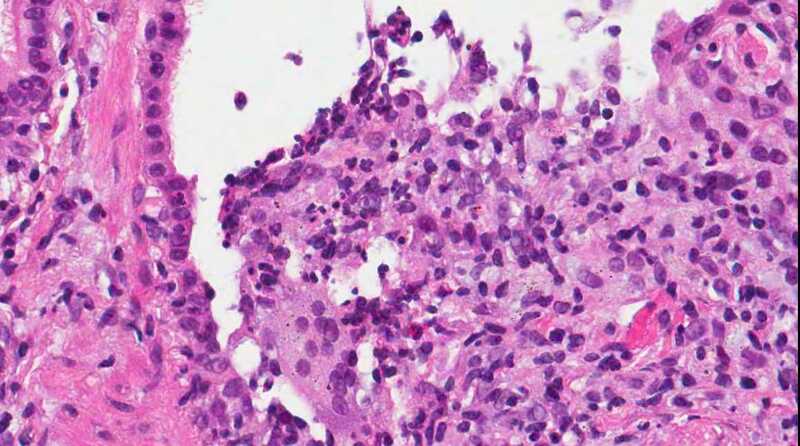 A 71 year old man with recent history of meningitis presented with recurrent episodes of pneumonia. High resolution CT scans showed "crazy paving" and "tree in bud" images. 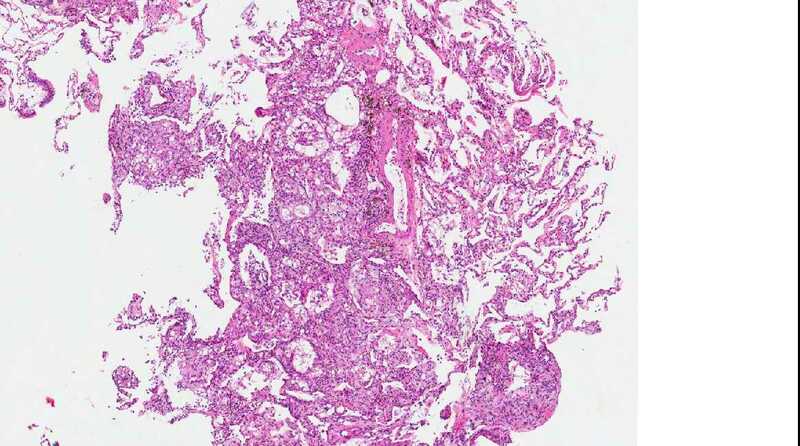 The patient underwent a transbronchial biopsy. 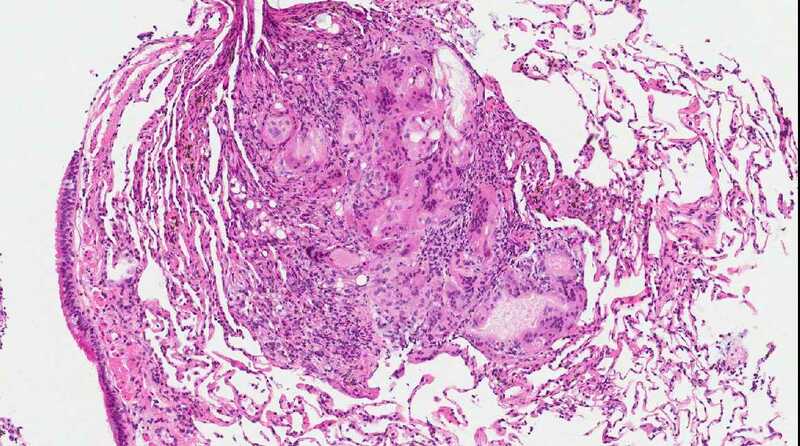 Aspiration of particulate matter, traditionally observed at autopsy, has also been described in debilitated patients, who often have a history of recurrent pneumonia (Am J Surg Pathol 2007;31:752), which is often unrecognized (Am J Surg Pathol 2010;34:1456). 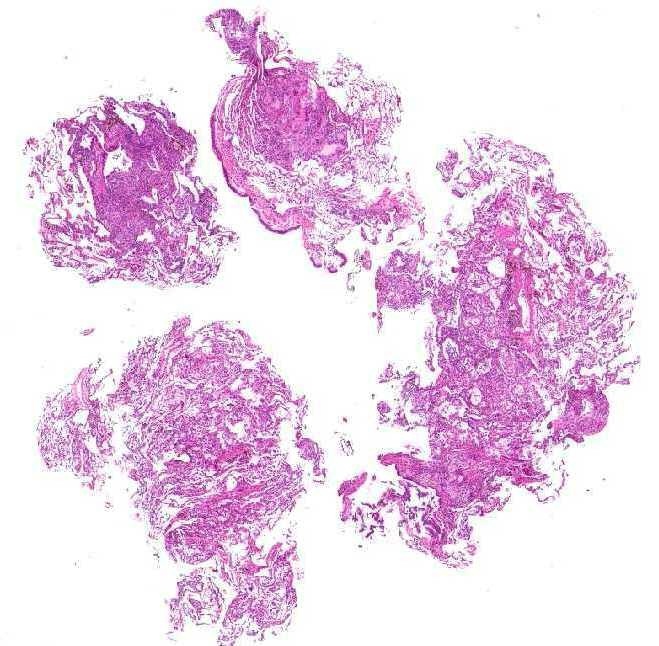 It usually (88%) shows bronchiolitis obliterans-organizing pneumonia, often with multinucleated giant cells, acute bronchopneumonia / bronchiolitis, or suppurative granulomas. Foreign material is usually, but not always (Am J Surg Pathol 2011;35:426) present. 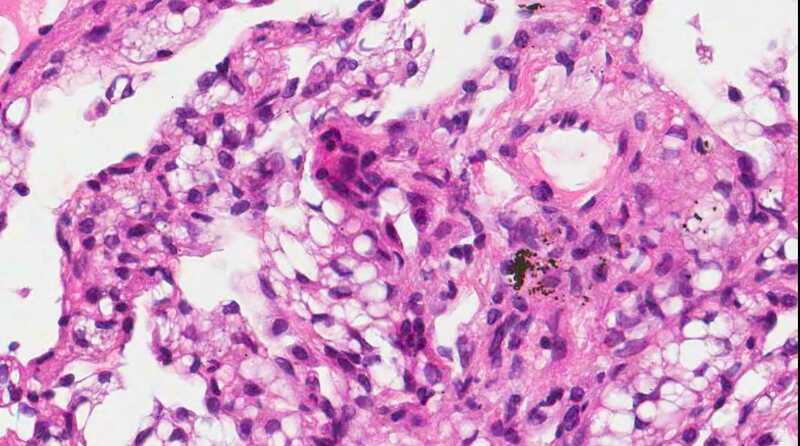 The differential diagnosis of pulmonary granulomatous inflammation is broad (Ann Diagn Pathol 2003;7:127, Histopathology 2007;50:289), and requires special stains, culture and clinical correlation. 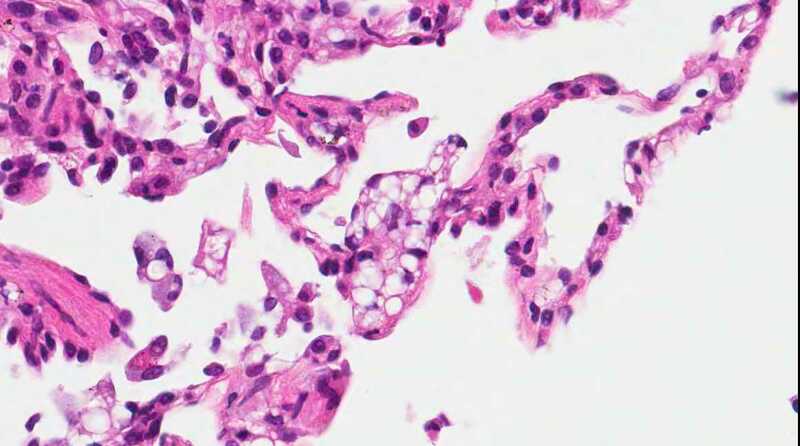 Lipoid pneumonia is often an incidental post-mortem finding associated with debilitating disease. 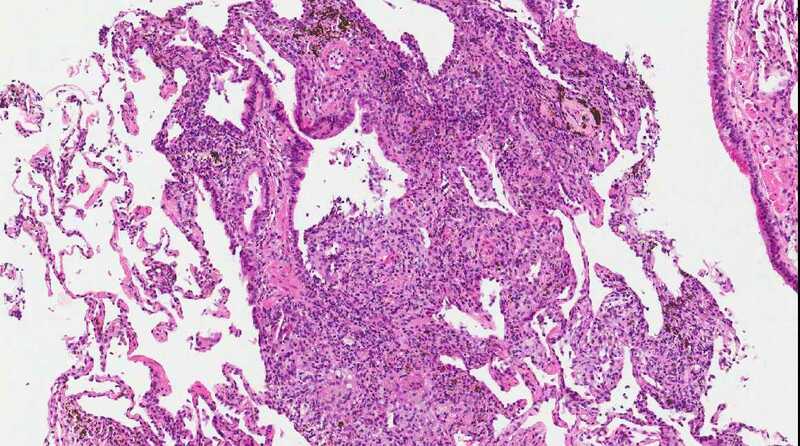 The lipid may be exogenous (from nasal sprays or inhalation of other lipid containing substances) or endogenous (bronchial obstruction).